Excellence hot stage systems offer the possibility to conduct polymorphism and solvate studies, characterize liquid crystal compounds and study crystallization and melting of polymers. The hot stages can be used for sample analyses under the microscopes, IR- and RAMAN spectrometers and in x-ray beamlines. Hot stage microscopy is a powerful method which is widely used to visually examine all kinds of thermal transitions. In the HS82, samples are heated or cooled while they are observed under the microscope. The HS84 DSC hot-stage can even simultaneously measure heat flow. The heart of all hot stage microscopy systems is the furnace with a heating element beneath and above the sample, which guarantees outstanding temperature uniformity in the sample. When the system was designed, great emphasis was put on satisfying the highest demands in terms of ergonomics. 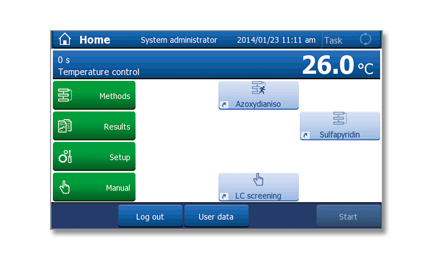 As a result of this unique concept, features like the small footprint of the measurement cell and control unit, the color touchscreen and control of the temperature program using manual keys offer important advantages. Access to the sample chamber from above means that the sample can be easily inserted and, if necessary, mechanically manipulated. The hot stage microscopy systems show temperature programs, marked temperature events and in the case of the HS84, the DSC curve on a wide color screen with excellent resolution. When measurement is complete, all data can easily be transferred to a computer by using the Ethernet connection, a SD card or an USB flash drive. The HS82 hot-stage system offers the best solution in all situations where the temperature of very small samples has to be regulated in a limited space and where the samples have to be observed at the same time. 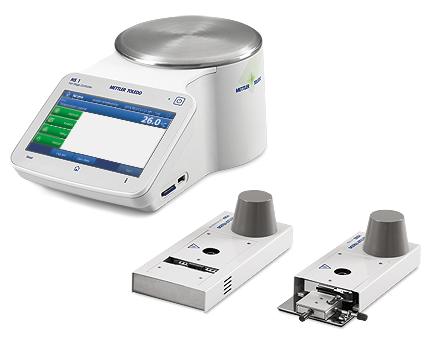 If you want to simultaneously record changes in the appearance of the sample and the calorimetric behavior, the HS84 DSC hot-stage system is the right choice. Hot-stage microscopy is a powerful method which is widely used to visually examine all kinds of thermal transitions when the sample is heated or cooled. The heart of all hot-stage systems is the furnace with a heating element beneath and above the sample, which guarantees outstanding temperature uniformity in the sample. The control unit is equipped with a wide color touchscreen. This allows intuitive operation with your finger, delivers clear information to the user, and is clearly visible from a distance. If repetitive measurements are required, one press of a key (One Click ™) is sufficient to start a stored method – the system looks after the rest. With 56 thermal elements, the robust FRS 5 ceramic sensor in the HS84 is highly sensitive and has unprecedented temperature resolution. It is therefore ideally suited to all possible applications of the DSC hot-stage.